Who turned off the glow worms? 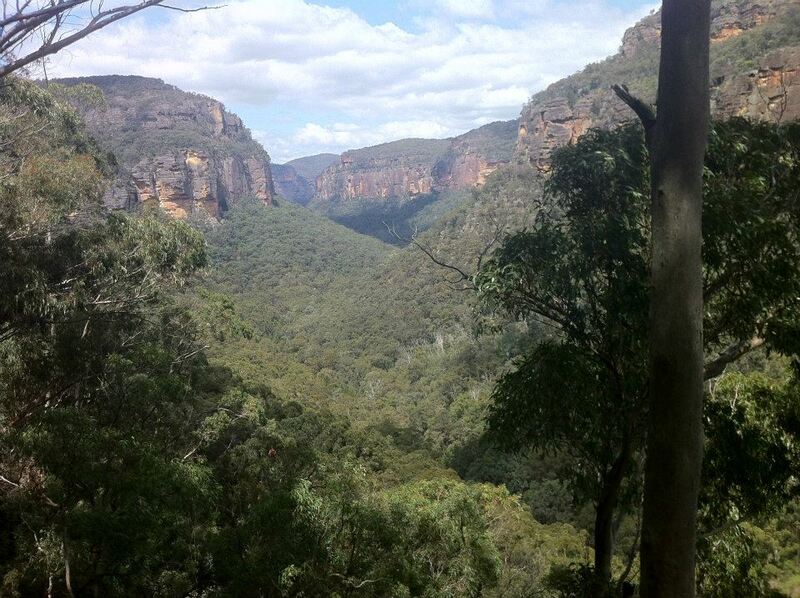 After Ben’s efforts he deserved a little rest from running, which gave me a chance to prepare for a marathon in the Blue Mountains, a two-hours’ drive from Sydney. 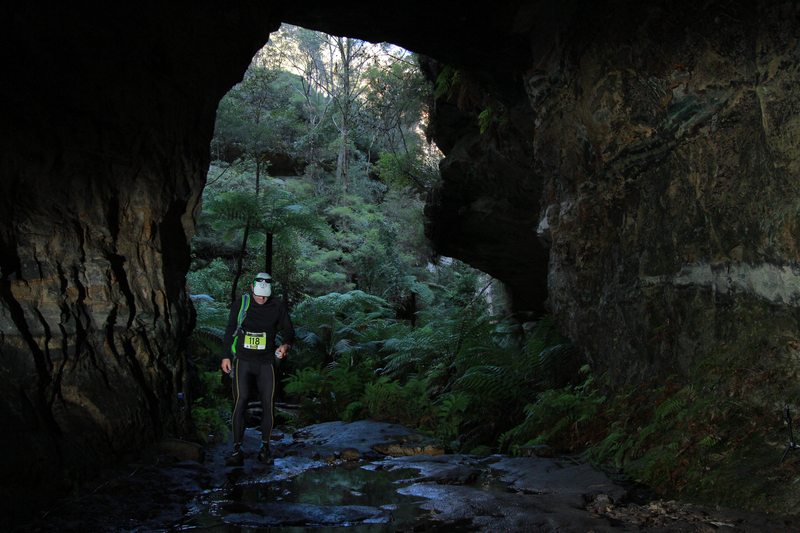 The Glow Worm Tunnel Trail Marathon had an interesting appeal of walking through a tunnel full of glow worms. Less appealing was the course profile which looked daunting to put in mildly. Denis, who decided to join me, wisely made the decision to sign up for the half marathon. Turning off from the main highway to Mudgee we started descending into Wolgan Valley where beautiful scenery of green fields and high, red cliffs awaited us. Passing the entrance to the Emirates Wolgan Valley Resort and Spa we were wondering how far we would get with our Wicked campervan if we dared to drive down that road. We arrived just before sunset and found one of the last camping spots where we could park ‘Wayne’s World’. 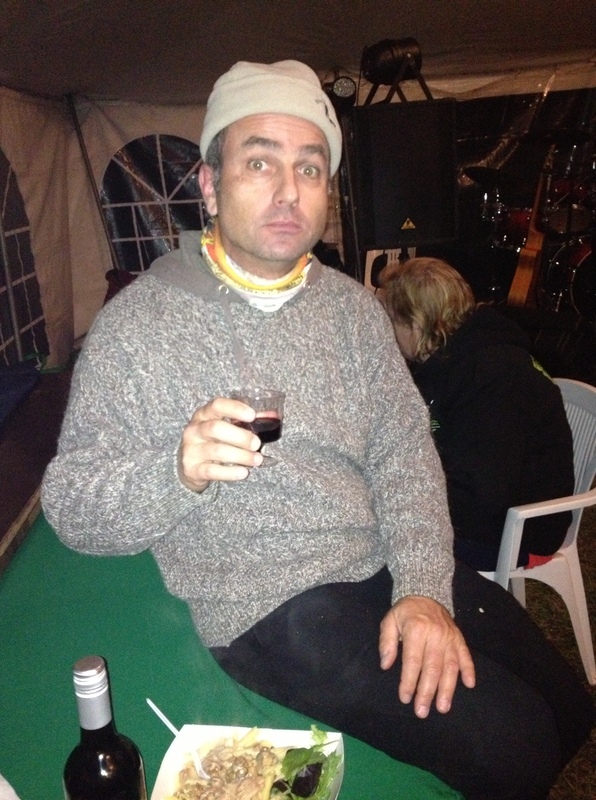 The whole event was brilliantly organised, and it took us only a few minutes to get a warm coffee from the café van parked next to the main tent where we found to our surprise a degustation table for Orange wine. What a great idea – because we were both wondering how to survive the cold night – so with a bottle in hand we wandered back to the van and fired up our little heater to enjoy a glass of red and watch the cliffs turn from red to black and feel the temperature drop to a very unfamiliar one-digit number. I was already commenting on the heights of those cliffs, and now I was wondering were the course would take me the next morning. At 7pm the pasta night kicked off, and since we finished off the first bottle sitting around the gas fire for the last two hours, we had to make a pit stop at the wine tasting table before queuing for pasta. An excellent choice of four types of pasta with bread and salad awaited us, and luckily we found the last two seats to enjoy a very descent carb-loading meal, which was washed down with some excellent drop from Orange. As soon as the food was finished a local band started performing some sing-along songs and the entertained crowed was happily tapping and singing along. With a full stomach we wandered back out into the cold to our van under a brilliant and bright sky full of stars! It didn’t take us long to quickly get into our sleeping bags, and thanks to Denis who fired up the heater for a few minutes before I arrived, we soon fell asleep in a nice and cosy van. I was glad I wasn’t in a tent, that’s for sure. When I got up around 6am to prepare for the 8am marathon start, I was not expecting the layer of thin ice on the table outside nor the extremely chilly sub-zero temperatures whilst sitting on the loo! It all took me about one minute, and within another minute I was back in the still warm sleeping bag. Denis was murmuring something along the line of ‘I told you so’ and we both happily snored away waiting for the sun to wake us up and warm us a couple of hours later. What a brilliant idea to have a half marathon start at the most descent time of 10.30am! In still very cold conditions we headed off towards the famous Glow Worm Tunnel 10km away. An incredibly beautiful trail through Jurassic-Park-style forests with big ferns slowly winds its way up towards the foot of those cliffs. Arriving at the top and entrance of the 600m-long tunnel we had to stop running and with a torch in hand slowly walk through. I turned off my lights a couple of times, but sadly could not see any glowing worms. They may have turned off with all these sweaty runners noisily making their way through their home. 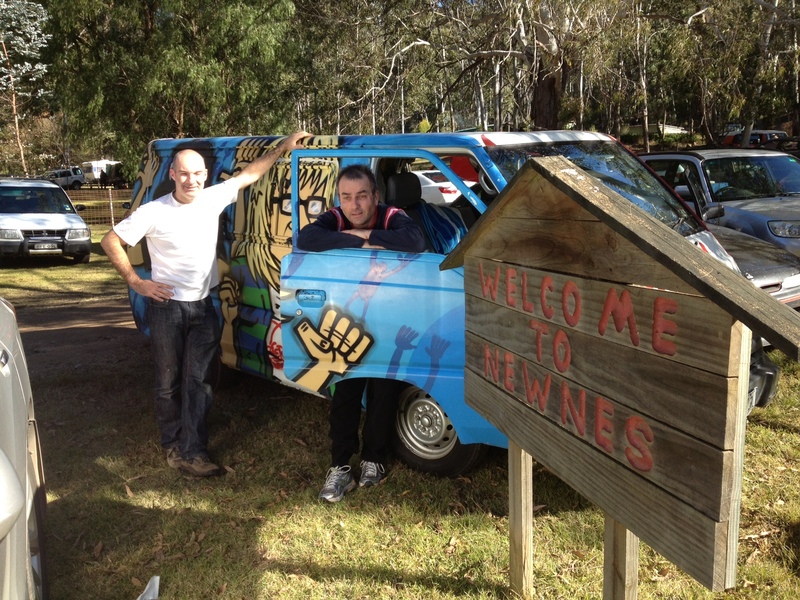 As soon as I was out of the dark it was a comfortable downhill run back to Newnes and the finish line. I made up good time and was quite pleased to only have lost 2 minutes on Denis who was waiting for me with a drink. We both agreed that we have to come back and maybe give the full monty a go, even though the runners who started the marathon almost three hours prior to us only just came towards the tunnel when we were on our way back out. So it must have been a slow and steep first half for those poor buggers, and it certainly looks like a good five-hours marathon for people like myself. 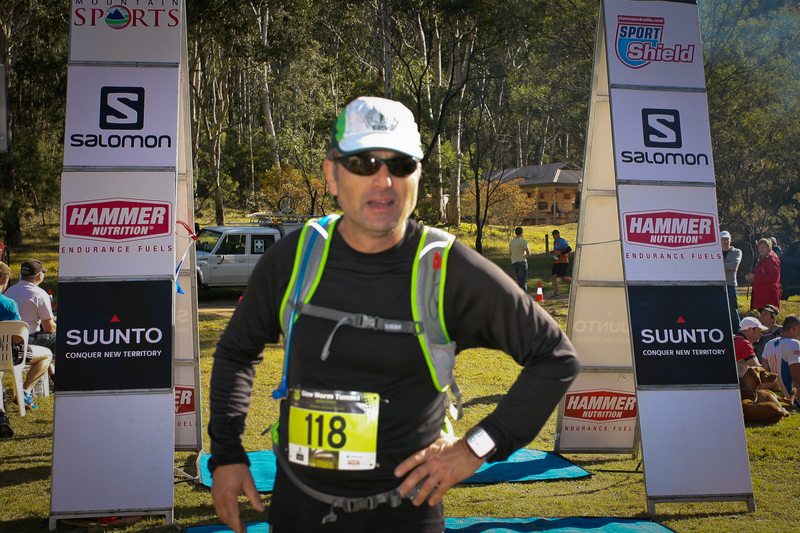 This entry was posted in Updates and tagged racing, sydney, trail running by run4vision. Bookmark the permalink.